Pierre Berton was one of Canada’s most popular and prolific authors. From narrative histories and popular culture, to picture and coffee table books to anthologies, to stories for children to readable, historical works for youth, many of his fifty books are now Canadian classics. Born in 1920 and raised in the Yukon, Pierre Berton worked in Klondike mining camps during his university years. He spent four years in the army, rising from private to captain/instructor at the Royal Military College in Kingston. He spent his early newspaper career in Vancouver, where at 21 he was the youngest city editor on any Canadian daily. He wrote columns for and was editor of Maclean’s magazine, appeared on CBC’s public affairs program “Close-Up” and was a permanent fixture on “Front Page Challenge” for 39 years. He was a columnist and editor for the Toronto Star and was a writer and host of a series of CBC programs. Pierre Berton received over 30 literary awards including the Governor-General’s Award for Creative Non-Fiction (three times), the Stephen Leacock Medal of Humour, and the Gabrielle Leger National Heritage Award. He received two Nellies for his work in broadcasting, two National Newspaper awards, and the National History Society’s first award for “distinguished achievement in popularizing Canadian history.” For his immense contribution to Canadian literature and history, he was awarded more than a dozen honourary degrees, is a member of the Newsman’s Hall of Fame, and is a Companion of the Order of Canada. Pierre Berton passed away in Toronto on November 30, 2004. Basic Books, 2006-10-18. Paperback. Used:Good. 2004-09-07. New. Ships with Tracking Number! INTERNATIONAL WORLDWIDE Shipping available. Buy with confidence, excellent customer service! 2004-09-07. Good. Ships with Tracking Number! INTERNATIONAL WORLDWIDE Shipping available. May not contain Access Codes or Supplements. May be ex-library. Shipping & Handling by region. Buy with confidence, excellent customer service! Carroll & Graf, 2004-11-15. Hardcover. Used:Good. Anchor Canada, 2005-05-17. Paperback. Used:Good. Toronto: Doubleday Canada, 2004. Red boards with gilt lspine lettering. Two corners bumped and lightly bumped at head and foot of spine, in a fine dust jacket. Signed by Pierre berton on a bookplate tipped-in to half title. . Signed. First Edition. Hardcover. Very Good/Fine. Doubleday Canada, Limited. Fine in Fine dust jacket. 2004. Hardcover. 0385660464 . A Good Read ships from Toronto and Niagara Falls, NY - customers outside of North America please allow two to three weeks for delivery. Signed by author on special bookplate tipped onto title page. ; 9.50 X 6.70 X 1.10 inches; Signed by Author . Anchor Canada. PAPERBACK. 0385660472 New Condition. . New. Carroll & Graf. Hardcover. 0786715073 New Condition. . New. Doubleday Canada, Limited. Hardcover. 0385660464 New Condition. . New. Basic Books. PAPERBACK. 0786718374 New Condition. . New. Prisoners of the North: Portraits of Five Arctic Immortals. Carroll & Graf, 2004., 2004. 1st ed. 328p. Photos. Maps. Jacket priced. In mylar. Fine/Fine copy. 1st. Hardcover. Fine/Fine. Anchor Canada. PAPERBACK. 0385660472 Like New Condition. . Fine. Basic Books. PAPERBACK. 0786718374 Like New Condition. . Fine. Doubleday Canada, Limited. Hardcover. 0385660464 Like New Condition. . Fine. Toronto: Doubleday Canada [0-385-66046-4] 2004, 1st edition. (Hardcover) 328pp. Near fine in near fine dust jacket. Map endpapers, photographs, illustrations, maps, index. There is a previous owner's inscription on the half-title. Book about Joe Boyle, Lady Jane Franklin, John Hornby, Robert Service & Vilhjalmur Stefansson. Locale: ; Northern Canada. (Arctic/Polar, Exploration). Doubleday Canada. New. 2004. Hardcover. 0385660464 . Hardcover; Toronto, Ontario, Canada; Doubleday Canada, Limited; 2004; 8vo 8 - 9 tall; Fine in Fine dust jacket; 328 pp. Top corners lightly bumped, otherwise book is BRAND NEW and unread. Dust jacket top corners bumped. ; 9.50 X 6.70 X 1.10 inches . np. : Doubleday., 2004.. First edition.. Hard cover. . Fine copy in fine dust jacket (in mylar). . Octavo.. Illustrated. . Photograph of OUR copy available upon request. Condition: Fine copy in fine dust jacket (in mylar). Toronto, Ontario, Canada: Doubleday Canada, Limited, 2004. First Edition . Hardcover. Fine/Fine. 8vo - over 7¾ - 9¾" tall. Fine red cloth. Map Endpapers. Fine green color pictorial DJ. (2004), 8vo, , 328pp. First printing # line to 1. CONTENTS: Klondike Joe Boyle; Vilhjalmur Stefansson; Lady Jane Franklin; John Hornby; Robert Service. "In Prisoners of the North, Pierre Berton depicts five remarkable characters captivated by this landscape, a mining tycoon; an Arctic explorer; a titled lady; a backwoods eccentric; and a best-selling poet. Doubleday Canada, 2004. Hardcover. NF./NF.. Compared lives of Klondike Joe Boyle, Viljalmur Stefansson, Lady Jane Franklin, John Hornby and Robert Service. B+W illustrations. Endpaper maps. Toronto, ON, Canada: Doubleday Canada, Limited, 2004. pp.328 with index b/w photos. Klondike Joe Boyle, Vilhjalmur Stefansson, Lady Jane Franklin, John Hornby and Robert Service. clean tight unread copy. First Edition. Hard Cover. Fine/Fine. 8vo - over 7¾" - 9¾" tall. F/F. Very lightly bumped sp in e head . D J ha s light rubbing. First Canadian Edition. First Printing. . Fine . Hardcover . 1st Edition . 2004 . Toronto, Ontario, Canada: Doubleday Canada, Limited, 2004. Reprint Edition . Hardcover. Fine/Fine. 8vo - over 7¾ - 9¾" tall. Fine red cloth. Map Endpapers. Fine green color pictorial DJ. (2004), 8vo, , 328pp. CONTENTS: Klondike Joe Boyle; Vilhjalmur Stefansson; Lady Jane Franklin; John Hornby; Robert Service. 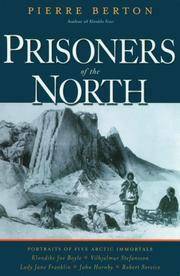 "In Prisoners of the North, Pierre Berton depicts five remarkable characters captivated by this landscape, a mining tycoon; an Arctic explorer; a titled lady; a backwoods eccentric; and a best-selling poet. Toronto: Random House [0-385-66046-4] 2004. (Cloth) 328pp. As new in near fine dust jacket. Illus., B&W photography, maps. Mapped endpapers. Includes index..
Trade Paperback. Book and Jacket are in Excellent Condition. 328 pgs. Toronto: Doubleday Canada, 2004. Hard bound, first edition, illustrated with maps and photos, 328pp includes index. As new in fine dust jacket. 670 grams. All books in stock and available for immediate shipment from Winnipeg, Manitoba. Basic Books, 2004-12-05. Hardcover. Good. Toronto: Doubleday. Fine in Fine dust jacket. 2004. First Edition; First Printing. Hardcover. 0385660464 . A Good Read ships from Toronto and Niagara Falls, NY - customers outside of North America please allow two to three weeks for delivery. ; 8vo - over 7¾" - 9¾" tall . Doubleday, 2004. Book. Very Good. Hardcover. very good reading copy, 3rd printing, no remainder mark. NF/NF. Lightly bumped spine e nd s. D J h as l ight edge wear and light rubbing. First Canadian Edition. First Printing. . Near Fine . Hardcover . 1st Edition . 2004 . [Toronto] : Anchor Canada, 2005. Paperback edition. Very good paperback copy; edges somewhat slightly dust-dulled and nicked. Remains particularly well-preserved overall; tight, bright, clean and strong.. Physical description; 328 pages : illustrations, facsimiles, maps, portraits ; 23 cm. Subjects; Canada, Northern -- Biography. Northwest, Canadian -- Biography. Basic Books, 2006-10-18. Paperback. Good. Anchor Canada. Paperback. 0385660472 . Good. 2005. Doubleday Canada, Limited. Hardcover. 0385660464 . Very Good. 2004. Anchor Canada. Paperback. 0385660472 . Very Good. 2005. Anchor Canada. 2005. Paperback. 0385660472 . 8.80 X 6 X 1 inches; 336 pages . Carroll & Graf. Used - Good. Former Library book. Shows some signs of wear, and may have some markings on the inside.